I hate the weather changes. My skin freaks out and then I have to start buffing away! I also don't know if it's just having kids or that I'm on the wrong side of 30 now, but my skin isn't as forgiving as it use to be. 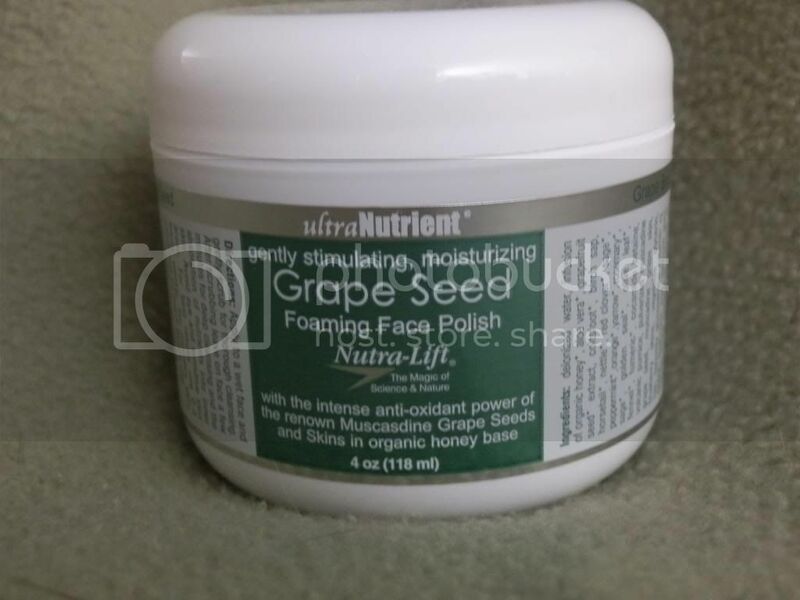 Mommy Moments with Abby's review of Nutra-Lift's Grape Seed Foaming Face Polish: I love things that can be used in a number of ways. I was happy to see that this could be used as a cleanser, with a larger application and smaller circles it becomes a polish, or you can apply and let it set to use as a mask. I started out using it as a polish, because that's what my skin seems to need to get down into the pores, but the kids woke up and I was taken from my circles. Suddenly, I remembered it was still on my face as I felt it tighten when I went to smile at the kids and so I ended up using it as a mask. As a mom, having a diverse product that can switch from a polish to a mask when being a mom comes up is exactly what is needed. It definitely seemed to leave my face feeling fresh and tight. I loved that the products were natural, giving my face a break from the makeup processed products that I usually cake on it. It gave me a smooth feeling on my skin that I haven't felt in a few years now. This mama was definitely pleased. A mask, and exfoliate a cleanser & toner all-in-one. A treatment provided by the most exclusive spas can now be done in the comfort of your own home. Grape Seed Foaming Face Polish gently removes dead cells and stimulates your skin with the power, nutrition and the anti-aging benefits of the renowned Muscadine Grape seed & skin. The Muscadine Grape has up to 2500 percent more anti-oxidants, phenols and flavonoids (ella-gic acid the known natural anti-cancer agent) than any other fruit or berry. Recent medical research indicates that Anti-Oxidants and certain herbs contained within, give even more protection from the sun. In addition grapes are high in resveratrol, know to reduce the aging process up to 80 percent. Plus Volcanic Pumice & blueberry skins, (mildly abrasive). Helps refine skin texture & tone and helps unblock clogged pores. Maximizes skins nourishment with a packed combination of certified organic honey, exclusive moisturizers, essential vitamins, herbs minerals and DMAE. For luminous, velvety smooth , healthy skin.